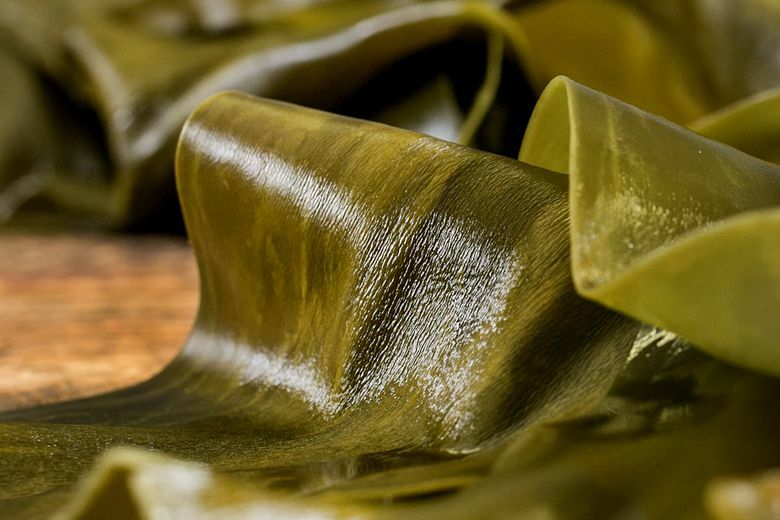 Kelp: It’s good for you, and it tastes good. Really. Seattle chef Matt Dillon’s kelp broth, or dashi, is a secret ingredient at his restaurants. KELP — A LARGE brown seaweed — has been eaten by coastal people around the world since the beginning of human history. Today, many people eat kelp for its health benefits and its flavor. Rich in vitamins and minerals, seaweeds contain elements such as iodine and selenium that are not found in adequate amounts in land plants, according to Dr. Ryan Drum, a retired botany professor who lives on Waldron Island. Drum recommends incorporating small amounts of seaweed into diets. He leads classes and “seaweed safaris” in the San Juan Islands and sells kelp at ryandrum.com. Of the 50 or 60 varieties of kelp, Drum prefers bullwhip kelp. “It’s easy to harvest, tastes the best, and it’s locally abundant,” he says. He sprinkles powdered kelp on oatmeal, pancakes and sandwiches — and raised three healthy children on it. With a permit, kelp may be harvested locally (up to 10 wet pounds a day). Drum advises against eating anything from waters south of Port Townsend due to pollution, but encourages harvesting from the North Sound and the San Juans. Kelp dries easily and, if stored tightly, keeps almost indefinitely. It also can be found at Asian markets and many grocery stores. Kelp rehydrates quickly and is great pickled or in soups, salads, beans and stir-fries. Seattle chef Matt Dillon, who has taken Drum’s classes, relies on kelp in his restaurants Upper Bar Ferdinand and Sitka & Spruce. He cures fish in kelp, rests all of his meat in it and uses kelp broth as a base for many dishes. Dillon’s kelp broth is a variation of traditional Japanese sea stock, or dashi. In Japan, dashi is made with just two ingredients: katsuobushi or bonito flakes (dried, smoked tuna) and kombu (dried kelp). “Kelp is the key to getting the umami we are looking for without using bones,” says Dillon, who is thoughtful about meat consumption at his restaurants. 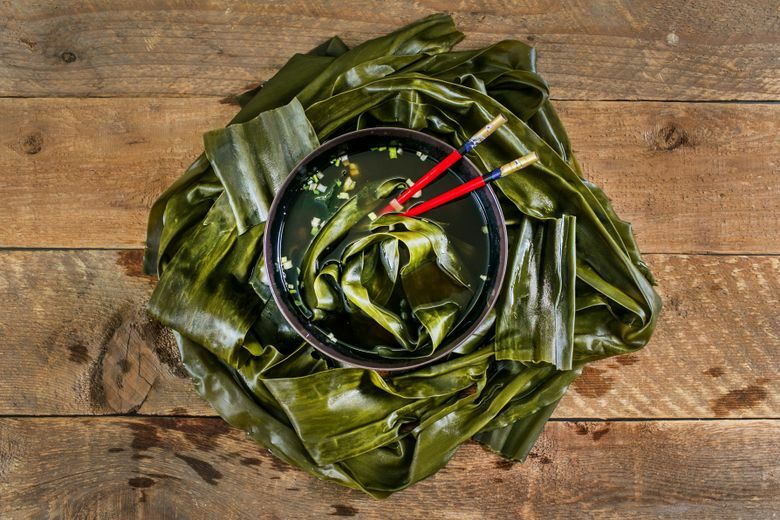 Making dashi at home is an easy way to use kelp. Incredibly flavorful and versatile, dashi is used in miso soups, stews, Japanese egg custards and vegetable dishes. Home cooks, who might not have smoked onions and dried garlic, can make Dillon’s dashi by dry-roasting the alliums first. Kelp broth is the best of both worlds — healthy and tasty. 1. Dry-roast onion and garlic in a medium saucepan over medium-high heat until soft. 2. Add other ingredients except bonito flakes, and bring to a simmer over medium heat, then remove from heat. Do not boil. 3. Add bonito flakes, and let sit for 7 minutes. 4. Strain mixture, pressing liquid out of solids. Rinse mushrooms and kelp, pat dry and reserve for another use, or chop and add to dashi for soup. Discard remaining solids. 5. Season to taste with salinity (shoyu or soy sauce) and acid (cider vinegar, brown rice vinegar or lemon juice), or use it unseasoned. 6. Store in refrigerator for up to a week, or freeze until use.